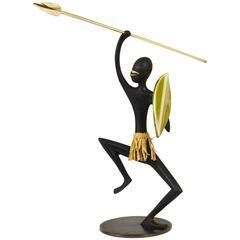 Amazing iconic African Warrior sculpture designed by Karl Hagenauer and manufactured by Werkstätte Hagenauer Wien during the 1950s. 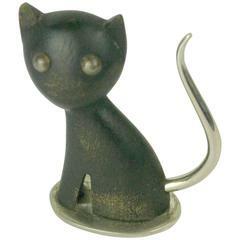 It is made of black patinated bronze and brass, marked on the underside Hagenauer Wien, WHW, made in Austria, handmade. Beautiful iconic piece designed by the Austrian Architect and Designer Carl Auböck, leather and brass with charming patina, signed in the interior side,. 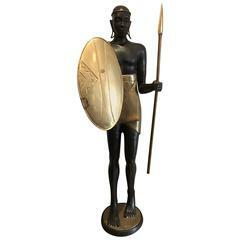 Vintage life-size bronze and brass sculpture of an African male warrior in Hagenauer Style. FREE SHIPPING: White Glove to Continental US. This high style sculpture of a leaping stag was handmade in the famed Werkstatte Hagenauer, Wien. 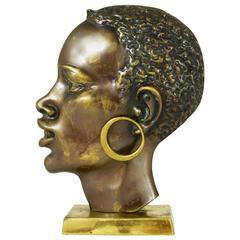 A beautiful modernist brass head of an African man on a square base in the style of Werkstatte Hagenauer. Made in Austria in the 1950s. In very good condition with charming patina.